When Dard Hunter returned to the Roycroft from a trip to Vienna in 1908, he was anxious to try out some new designs he had in mind for metalwork, and especially for jewelry. After great success in fabricating a few pieces of silver jewelry, he decided to teach his techniques and designs by establishing the Dard Hunter School of Handicraft. With Elbert Hubbard’s permission to pursue this as a “sideline” he began advertising for students. The school espoused his personal philosophy of the value of making things by hand. Full instructions and tools were furnished to his students, along with detailed drawings and photographs of jewelry he had designed and made. In the first year, 149 people had enrolled in the correspondence school. Hunter supplied each of them with drawings such as these, along with tools and even silver and copper materials. By early 1910, Hunter was preparing for another trip to Vienna, and he handed responsibility for the school’s activity over to Karl Kipp, another Roycroft craftsman. Enrollment was on the decline, however, and no further mention of the school or its activities was made after the fall of 1910. 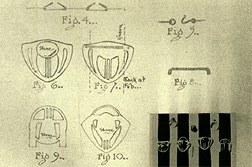 The designs for our jewelry are taken entirely from Hunter’s original sketches and photographs. Each piece is meticulously hand crafted from sterling silver and semiprecious stones to match the style of the originals.